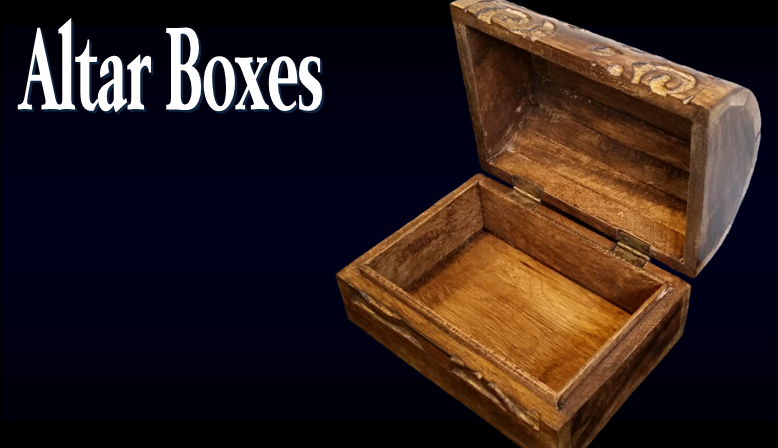 Keep your altar clean and tidy with a beautiful and decorative altar box. 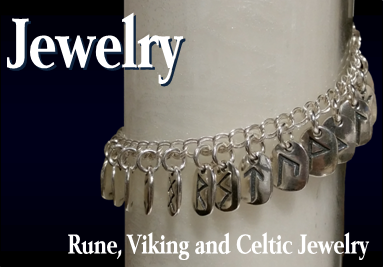 A large selection of beautiful rune jewelry for men and women featuring rings, pendants, earrings and bracelets. 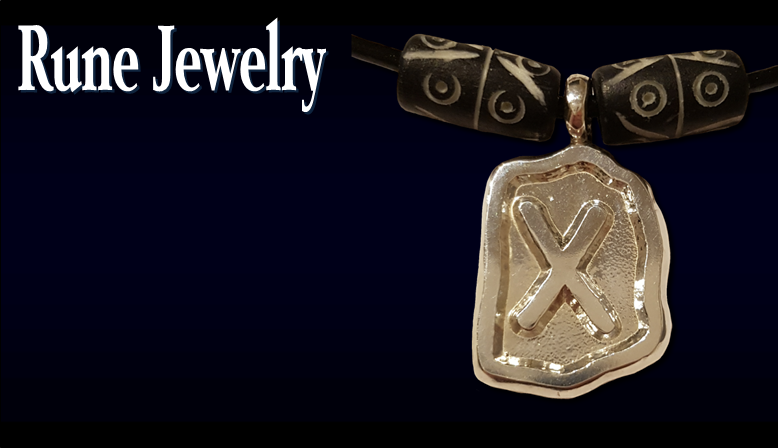 Many of these pieces are made to order and customizable for a fantastic unique look. 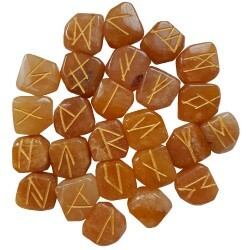 A unique set of Elder Futhark stone runes made of tumbled peach aventurine stones. Each rune is hand carved and painted gold. Use the color white to invoke the powers of Odin with this beautiful runes set. 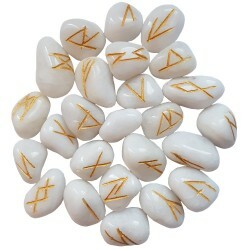 The golden runes shine off of the milky white background of these white quartz runes. 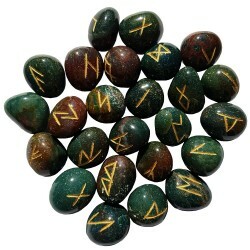 This is a set of 25 traditional Elder Futhark runes and comes with a bag. Set of 25 Elder Futhark rune stones made of bloodstone with handcarved runes. Comes with a velveteen pouch. 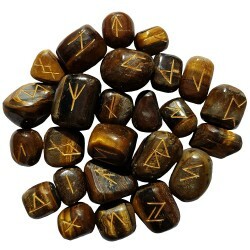 Set of 25 Elder Futhark rune stones made of tiger's eye with handcarved runes. Comes with a velveteen pouch. Black powder coated iron drinking horn stand suitable for horns over 12" tall. 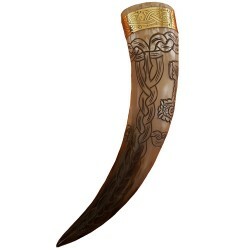 This drinking horn tankard is crafted from a single horn. 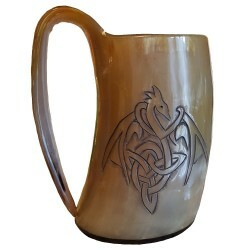 Measuring about 6" tall this mug will hold about 32 oz of your favorite Viking drink. Each horn varies in color and they range from black to white with shade of greys and golden browns. 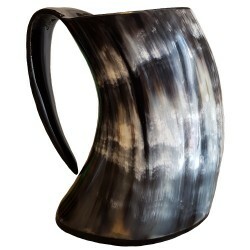 These horn tankards are sealed on the inside with a thin acrylic coating. 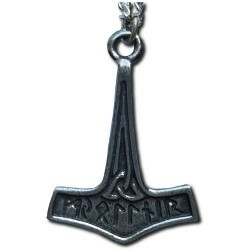 This small hammer has a Celtic knot work design, it is made from lead free pewter and comes with a black cord and is presented on a card telling of the Norse God Thor and his chosen weapon, Mjolnir. This pendant is approximately 5 grams and is double sided. This fabulous Gothic style piece is an exquisite mixture of darkness and beauty. Finished in silver and gold and decorated with a Swarovski crystal. Comes with a chain and is presented in a pouch. This pendant is approximately 7 grams and is single sided. This rustic looking pendant has a rough knotwork design. 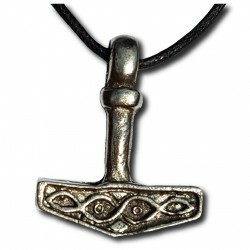 It is made of lead-free pewter and comes with a black cord. 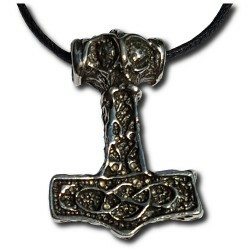 It is presented on a card telling of the Norse God Thor and his chosen weapon, Mjolnir. This pendant is approximately 8 grams and is double sided. 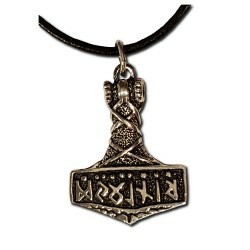 This Thor's hammer pendant has its name "Mjollnir" carved in runes across the front. Made of lead-free pewter it comes with a matching chain. This pendant is approximately 2 grams and is single sided. 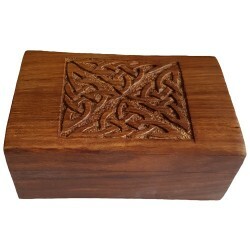 Wooden box with a dark stain and a metal triquetra design on lid. 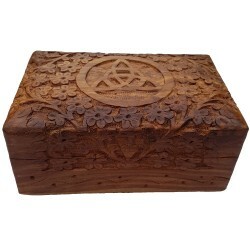 Wooden box handcarved with flowers and a triquetra design. 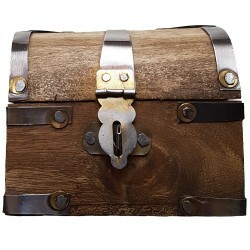 Small wooden chest storage box with metal closure. 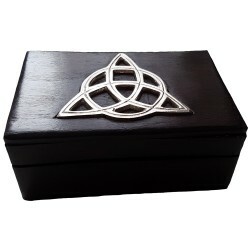 4"x6" wooden box with a hinged lid featuring four engraved triquetra images. 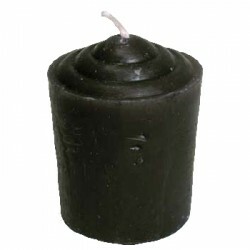 Solid colored votive candles available in multiple colors, up to 15 hour burn time. These need to be burned in a votive holder. 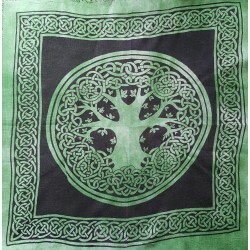 Tie die green with a black Yggdrasil and Celtic knotwork design and fringed edges. This altar cloth is 18" square. 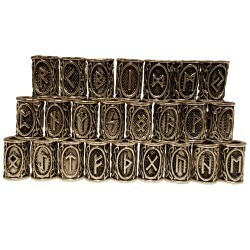 These metal Viking runic beard beads/hair beads feature the Elder Futhark runes and Celtic knotwork designs. Each order of beads comes with one free hair threader (please select option) and a supply of clear hair elastics. 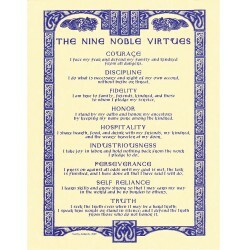 Rune meanings and letters listed below. 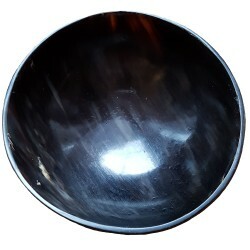 Buffalo horn offering bowl polished to a high shine, available in two sizes. Three legged wooden stand craved from a single piece of wood. 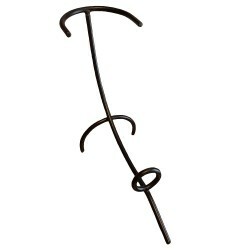 This stand is available in five sizes. Size is the length of the legs. 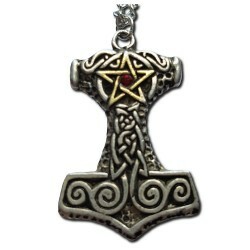 Each of these Thor's Hammer keychains are laser engraved with runes and Celtic design accents. 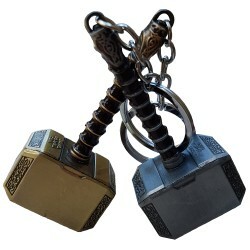 These keychains are made in the classic Marvel style and available in your choice of color. They are made of zinc alloy, plated with gold or silver colored finish accented with brown enamel bands on the handle. 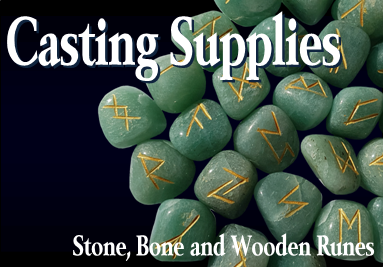 Here at Asgard Gifts our focus is Asatru and Vikings, we strive to supply the most complete selection of Asatru supplies available on the web. In our constant search for new and exciting items for your homes and altar spaces our inventory is constantly growing and changing to meet the needs of our customers. With us help is just an email away. 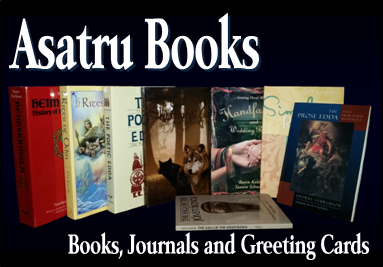 Whether it be questions about items, orders or Asatru in general we are here to help feel free to contact us anytime. Don't forget to register today to receive our email newsletters and exclusive member only coupons. Enjoy your time at Asgard Gifts and may Odin's wisdom guide you! He who has seen and suffered much, and knows the ways of the world, who has traveled, can tell what spirit governs the men he meets. 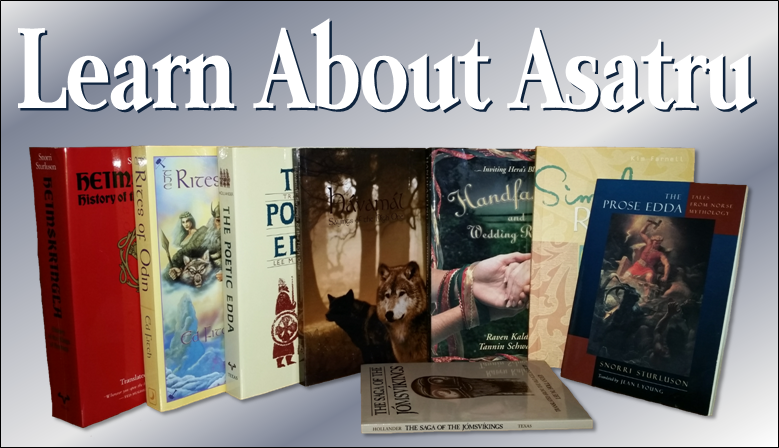 Join us at TruAsatru.com to learn about Asatru and connect with others in the community. Tru Asatru is an informational site, being written by Thor, as well as providing a community forum and a platform for you to write your own blogs on Asatru and related topics. We also offer a community calendar to post your upcoming events. Come join us and help Tru Asatru grow! We completely understand! Please be advised that not accepting will limit our ability to assist you.